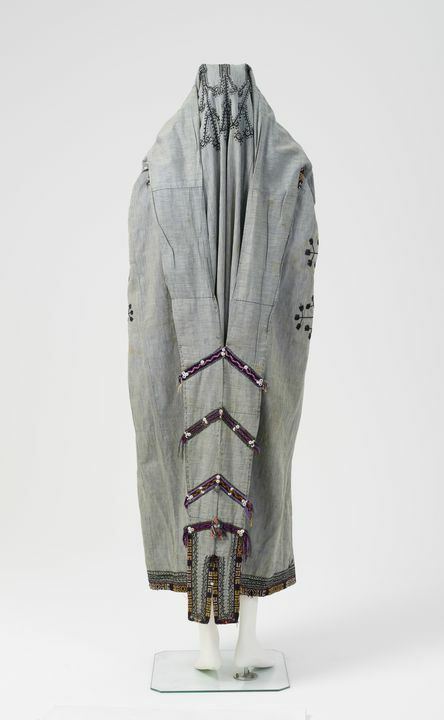 Made by Tajik people in Turkestan, c.1900. The paranja is made of natural coloured cotton with fine blue pin-striping. At the back, false sleeves are joined around waist level and fall almost to the hem. On the front are slits for the arms. The front, hem, arm slits and 'cuffs' of the paranja are edged with zey braiding, which was woven in situ and then embroidered with yellow, black and red cross stitch. Rows of black, geometric embroidery and feather-like plant motifs, whose stitches go through all layers of the cloak, have been worked within the zeh bands. Additional ornament comes from plentiful small white buttons, multi coloured tassels and silver bells; four rows of toggle closures cross the front of the garment. The paranja is completely lined with a number of different cottons which have been carefully pieced together. The more visible fabrics are white-on-red Russian printed cottons and two different twill-woven yellow and green striped cottons used as wide lining band to the hem and front edges . Early (19th century) paranjas were quite sober in appearance, being mostly made from blue or silvery-grey and finely-striped cotton fabric like this example. With the availability of new materials, paranja design became rather more adventurous and a fashionable woman might wear one made from bright ikat, velvet or brocade. The form however remained very much the same. Decoration also changed as tassels, buttons, metallic ornaments were lavished on the paranja to enhance the simple black braid and black embroidery of earlier times. Unlike other items of women's dress, the paranja was not made at home but was commissioned from women who specialised in their production. It appears that the measurements were standardised. The black embroidery is hand done, and is worked through both outer cloth and lining. The zeh (or dziyak) edging is worked in place on the robe itself, and was an independent craft. During the 1800s the Russians promoted the cultivation of cotton and mulberry trees and, until the Soviet regime was established in the 1920s, the production of silk and cotton fabrics was run as a cottage industry with a clear division of labour. Women were responsible for the rearing of the silkworms while men actually produced the silk fabrics. Women were also the embroiderers. Purchased by Christina Sumner from a woman vendor at the Urgut Sunday market during an overseas-on-duty visit to Central Asia in October 1999; subsequently sponsored for the Museum collection by the Oriental Rug Society of New South Wales.